Where was Adele when I needed her ’cause I’ve been deep into rolling for years! 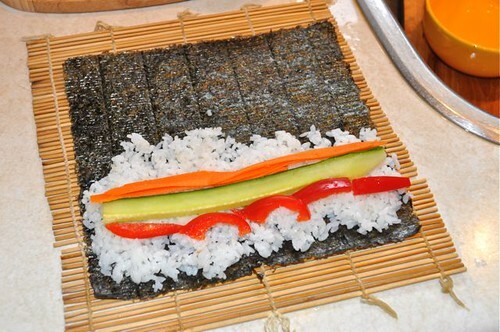 When I first discovered sushi, my life was transformed. 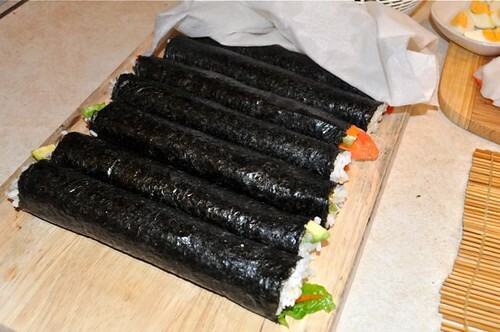 I remember my first roll ­– it was the mid 80’s, and I had everything that ever ended up in sushi, ready to roll. 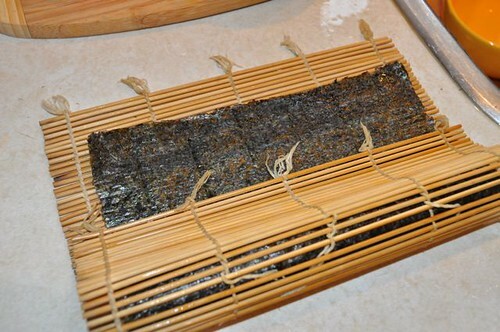 The sheet of seaweed (nori) made it around but one time, hugging my concoction like spanx. We all have to start somewhere. And after 2-3 decades of rolling, I’m pleased to report that I’ve slimmed down immensely and roll ‘em like the pros – and so can you! And it won’t take long – really! 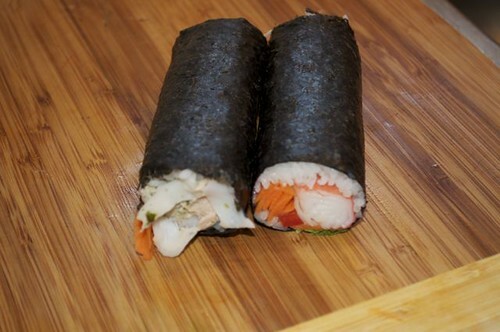 Purists aside, anything can end up in a sushi roll – but first you need to make the rice. 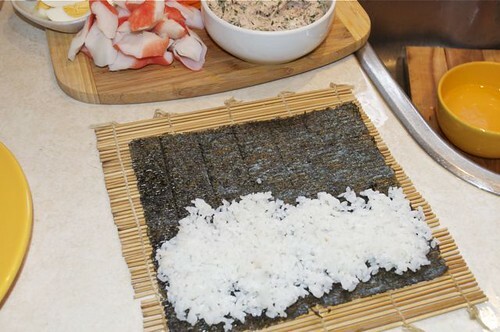 So instead of me going on and on, here’s a video to save both of us a lengthy discussion, so here’s how to make perfect sushi rice – it’s worth it to get it right. Once you’ve got the rice down, you’re halfway home. 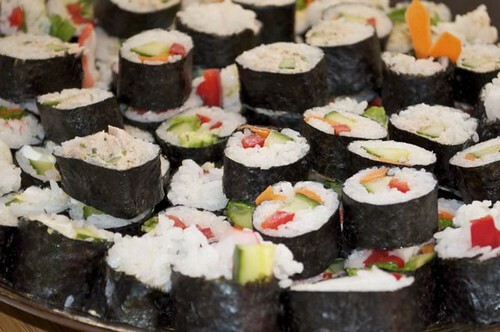 All you need now is a sushi mat, sheets of seaweed (nori) and soy sauce, wasabi & pickled ginger – all available in the Asian aisle of your grocer. 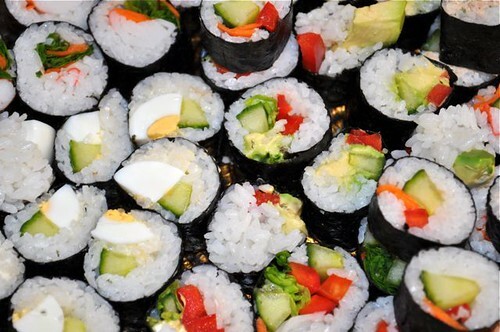 The rest is up to you – as you will see from my approach, everyday items can end up in sushi – tuna salad, hard-boiled eggs, lettuce, carrots, red peppers, avocado, cucumber, imitation crab – the list goes on and on. 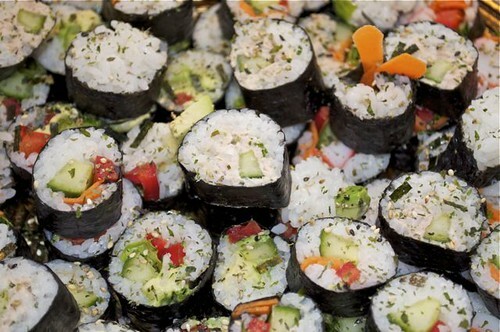 And for the more adventuresome – get yourself some sushi-grade fish & seafood and have a real feast. Your first stop however, is to the Asian aisle/market to pick up a few sushi essentials before unleashing that sushi-making beast inside – it’s as everyday as P,B & J in Japan! 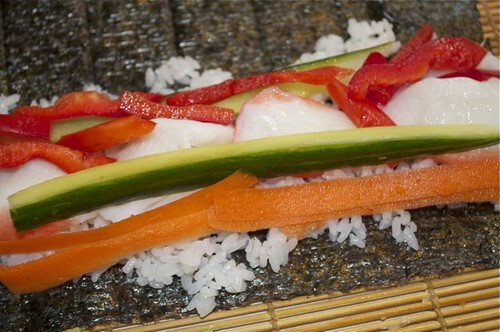 So between me and cyber sushi school – you can make sushi like it’s P, B & J! So here’s to really rolling in the deep! Any questions? You know where to find me! 2. 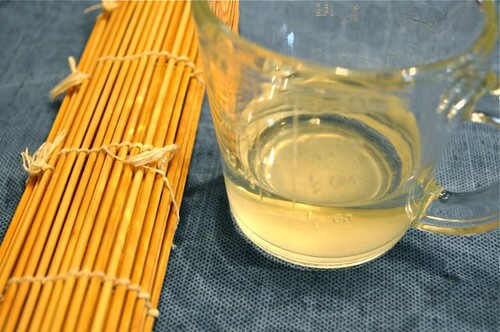 Make the sushi dressing – taste it, it should be noticeably sweet. 3. Get your hot rice in a large shallow bowl. 4. Pour the dressing over top and start folding and fanning the rice. 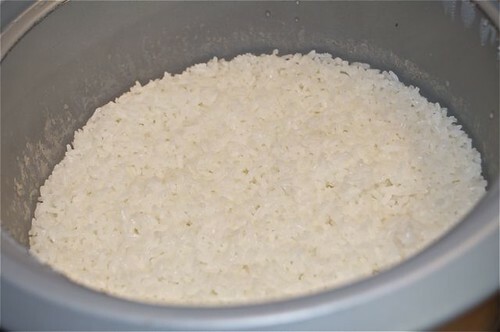 The idea is to cool off the rice as quickly as possible. Stop folding when there’s no more steam. 5. So it looks like this. The grains will be glossy and gorgeous and yes, sticky! 6. 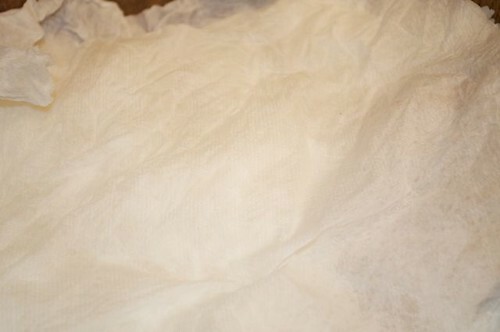 Cover the rice with a damp towel to keep the rice from drying out – either cover it for later or drape it while you work. 7. 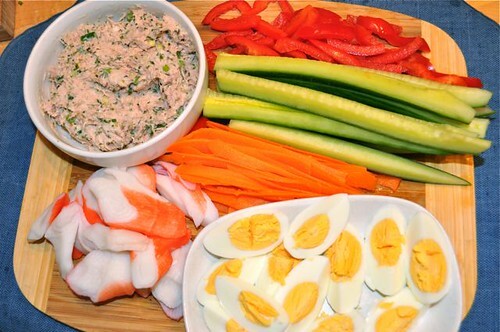 Get your fixin’s together – here I’ve got tuna salad, crab, hard-boiled eggs, strips of carrots, cucumber & red pepper. 8. A word about the tuna salad – flavour it up any way you like. Here I’ve added a seasoned sesame seaweed mixture available in the same aisle where you found the nori, wasabi & pickled ginger. 9. 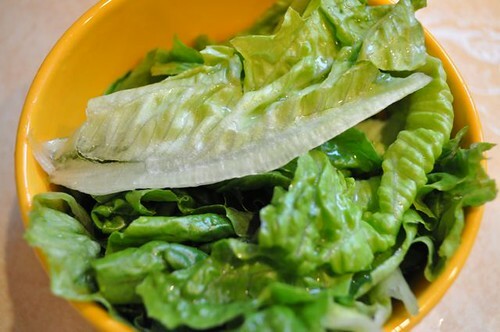 Lettuce is always part of my sushi party – it’s the secret rolling tool, romaine works great. Just lay it over top of the other ingredients, it really helps you grab and roll. 10. 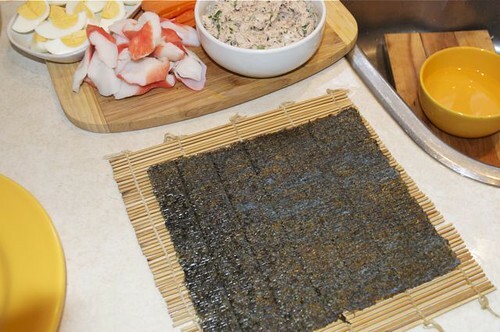 Get a sheet of nori on the mat. 11. 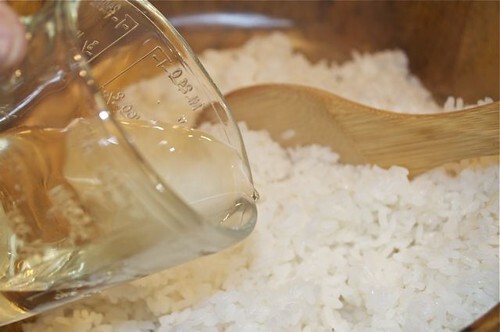 Smear the bottom half with rice. 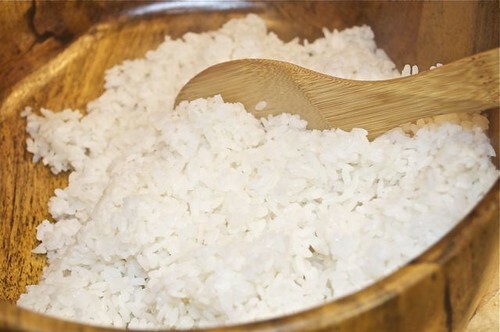 ALWAYS work with damp hands, if you don’t the rice will stick like the dickens – to your hands, to your hands! 12. 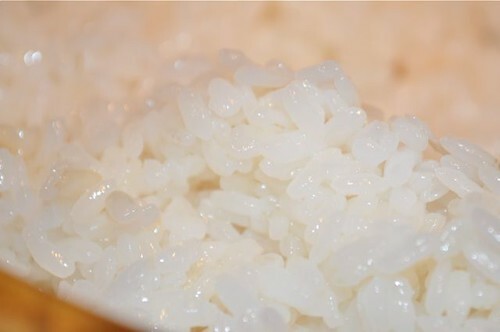 Choose items to lay on the rice, just like this – a little bit of this and a little bit of that. 13. Get a hold of the edge of the mat closest to you and lift it up and over as you pull it away from you, work it into a roll shape, gently squeezing it as you pull the mat to the end. 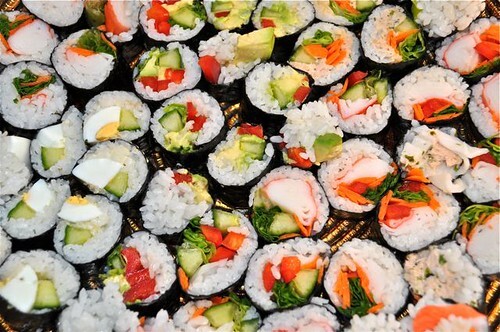 Be confident – it’s only sushi! 14. The mat is over the top – use it to pull the works into a roll. 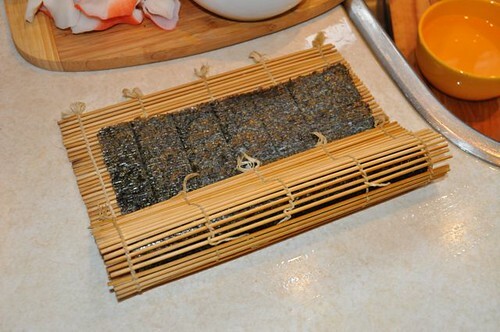 Don’t get the mat caught up in the sushi, use it to pull it into shape, until it’s all rolled up. 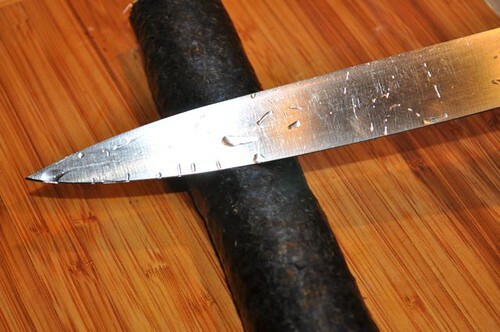 Moisten the end of the seaweed, it will create a seal like an envelope, before rolling up completely. 15. Just like this. 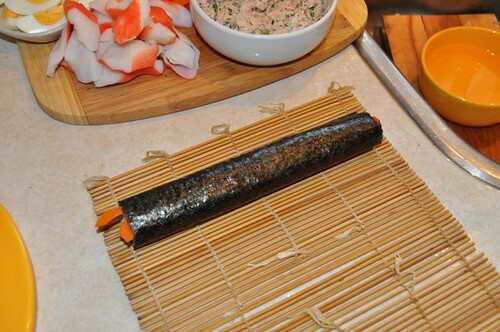 Move it to a platter, loosely cover with a cloth and continue rolling. 16. 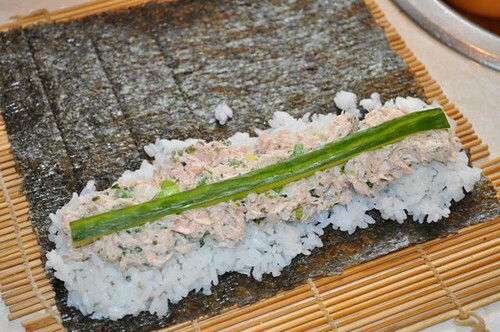 Repeat and fill with whatever you’ve prepped to go in your sushi – roll #2 – tuna and cucumber. 17. 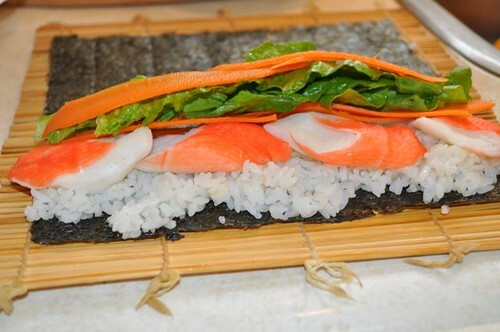 Roll #3 – crab, carrot strips and lettuce. 18. 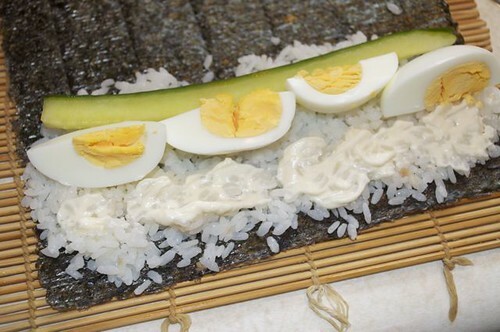 Roll #4 – hard-boiled egg & cucumber. 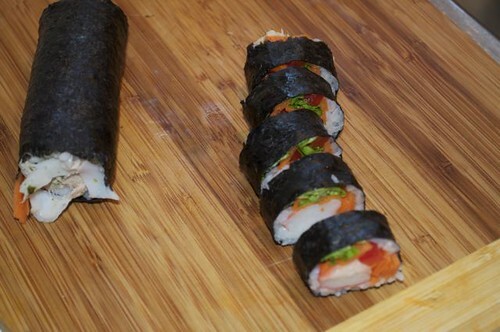 A little mayo smear is nice to add a little richness – mix a shot of hot sauce into your mayo and voilà – a spicy roll. 19. 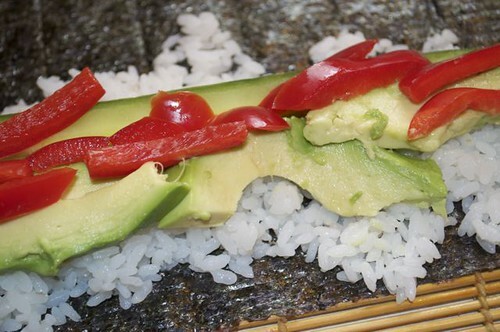 Roll #5 – red pepper strips and avocado. 20. 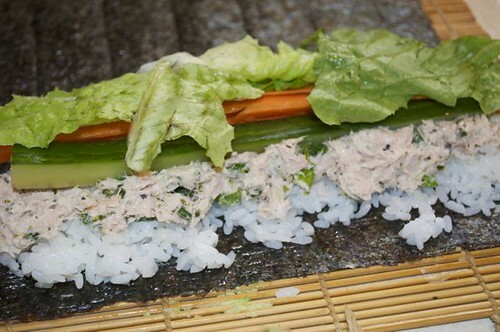 Roll #6 – tuna salad, cucumber, carrot & lettuce. 21. 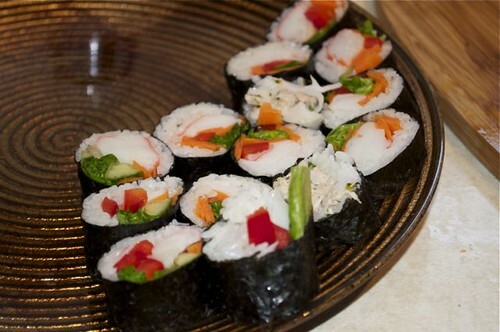 Roll # 7 – crab, carrot, cucumber & red pepper. 22. 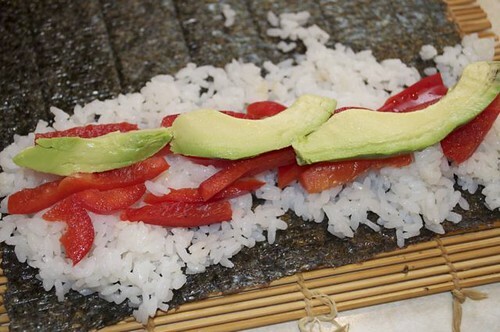 Roll #8 – red pepper strips and avocado – as you can see the rolls and the combinations are endless. 23. Just keep lining up your rolls. Be slightly mindful near the end so you can divide the rice/filling ingredients up evenly so your last roll isn’t a disaster! No rice lots of filling or too much rice and no filling. 24. Now it’s time to start cutting your rolls into pieces. A damp knife glides through like butter. 25. First, cut the roll in half. 26. 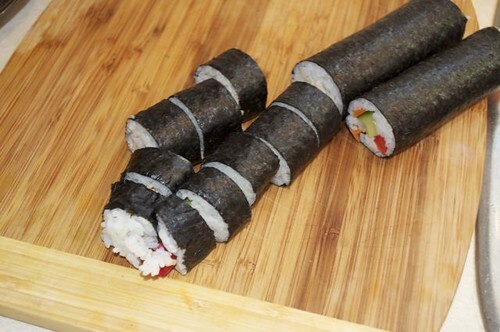 Then cut each half into bite-sized pieces – it can range between 3-5 pieces per half depending on how packed each roll is. The more that’s in there, the fatter it will be. Think cucumber roll vs California roll. 27. Keep cutting the rolls into pieces. 28. Arrange them on a platter – keep cutting & arranging. 29. And when the platter fills up – just make a second layer – start in the middle and work out for a pretty platter. 30. 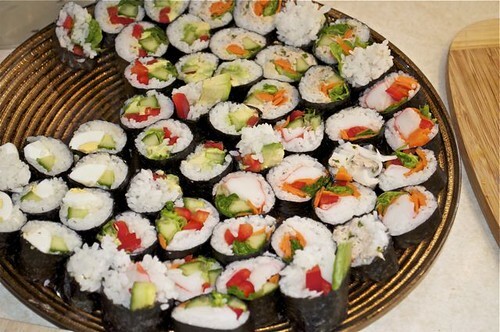 Your friends & family will be very impressed with your mile-high platter of sushi! 31. 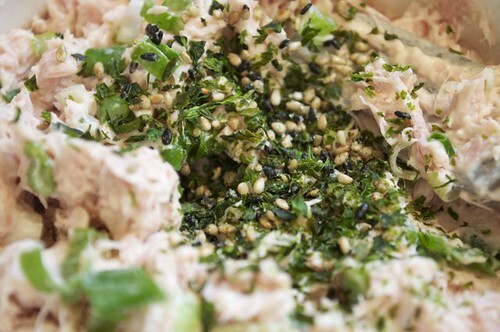 I sprinkled on the sesame seaweed shake I used in the tuna for a finishing touch. You could use sesame seeds – the black ones look quite dramatic! 32. Or you could just serve as is. 33. 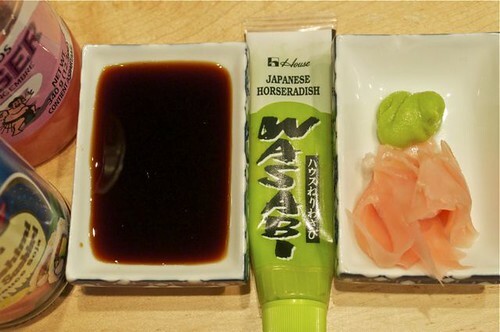 And of course, the starring players are the wasabi, soy sauce and pickled ginger. 34. Now sit back and admire your handy work – if it’s for later, cover with plastic wrap and refrigerate until you’re ready to eat it. And if it’s not – get your soy, wasabi & ginger ready and dig in! There’s no question that you are an amazing cook! It was hard to pick your best one! Congrats! You’re featured! Not Your Ordinary Recipes!